Prudent baby whipped up these adorable handmade crowns made out of fabric. Perfect for a princess Halloween costume or for dress up any day of the week. I love that she has a link to the free downloadable crown templates she used and that the crowns will keep their shape for years to come! For lots more pictures and ideas to make fabric crowns check out Prudent Baby. Heidi from Happiness Homemade put together this awesome DIY tooth fairy costume for herself! She re purposed her wedding dress as a tooth fairy dress, although you could use any white dress! Heidi crafted up a tooth fairy wand, a stary glitter headband and added some store bought wings…. perfect! Now she just needs a tiny little bag to keep all of the teeth in that she picks up every night! See the the full DIY tooth fairy Halloween costume on Heidi’s blog, Happiness Homemade! Happy national tiara day! Tiara’s are a really awesome costume accessory, don’t ya think? Here are 5 tutorials for making handmade tiaras. It’s the perfect addition to the dress up box and to use for costumes this Halloween! 1. Leslie from Sew Leslie made a fun Rupunzel look a like tiara for her little one. She used Mod podge and craft foam. 2. Ashley from Cherished Bliss has a fun tutorial for fancy handmade fabric crown! 3. And here is a unique tiara made out of clay, wire, and crystals from Jerri Lynn Reeves. 4. Here is an adorable tiara made out of a paper bag and artificial flowers! This would make the perfect addition to a woodland fairy costume Ohhh or how fun would it be to make these at a little girls birthday party? See the all of the handmade tiara details at Happy hooligans. 5. 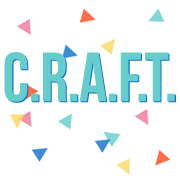 If you love handmade, but don’t have time to make it, you can buy a handmade crocheted tiara from my canasta partner, Barb, at her online store for only $6! Isn’t it cute!